San Francisco, CA – iClock, is the first app to report compatibility with the next Mac OS Mojave. Apple Mojave will be released in the fall but iClock is available now. Anyone can download it immediately to see exactly how useful it is. Download link for iClock – Enjoy trying all features free. – Visual effects supervisor “Fantastic Four: Rise of the Silver Surfer”, “Star Wars: Episode I – The Phantom Menace”, “The Lost World: Jurassic Park” and many other movies. 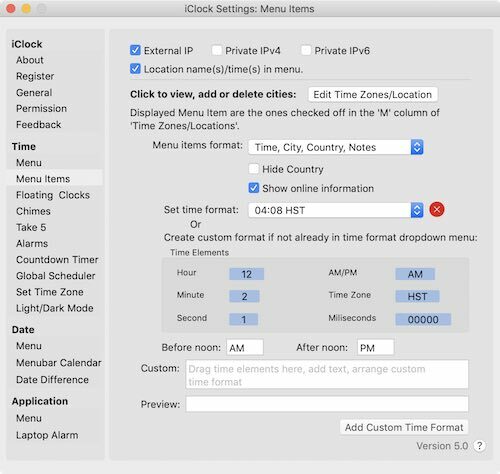 On the Mac iClock enhances productivity by having MANY time related apps all available with a click tap on the clock or calendar up in menubar. Great for managers of people or products. Great for anyone involved in social media. Great for professionals, students and anyone whose work depends on time. Time– Display time in the menubar but with settings to change font, size, color, format*, etc. *Format allows setting by drag&drop an infinite number of variables to display time and date exactly how you like it. 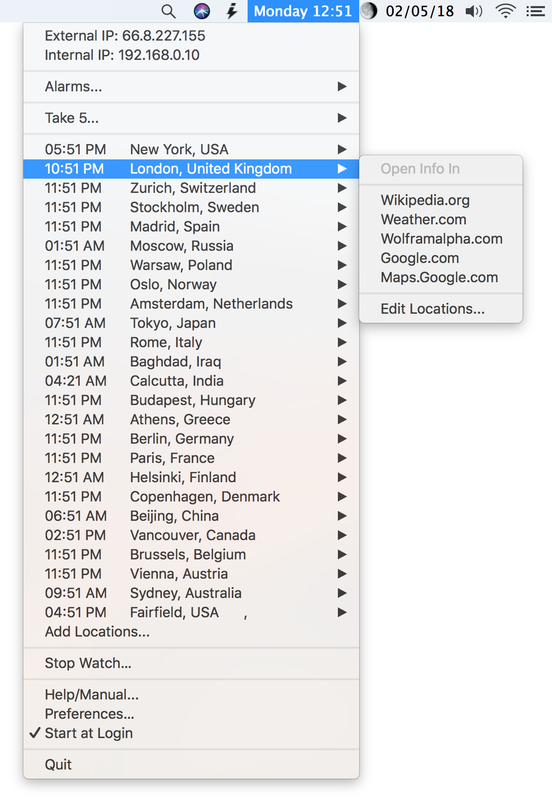 World Time – A quick tap on Time in the menubar reveals a menu with every city or timezone you want to display the local time. External & Internal IP – add if you need to see and copy your IP address. Floating Clocks – handy for people like traders or brokers who need to constantly know the time in various markets worldwide. Count Down – a window which can display a countdown to Christmas, New Year, your anniversary or whatever. Date – Display date in the menubar but with settings to change font, size, color, format*, etc. Tiny Calendar – can show 1, 2, 3 months at a time. This calendar works in conjunction with the Apple or Google Calendars and can display events all available with a tap on the menu. Big Calendar – can show 1, 6, 12 months at a time, with optional photo which can then be printed for a 1 month or year calendar as a gift or for your wall. “Best time I ever had!!! !” – Charles Henry, PanTech, Inc.
“I like the app iClock. All the features you like and none of the features you don’t like” – Andy Ihnatko, Journalist, Writer, MacBreak Weekly. Plum Amazing Software today announced version 4.3.5 of iClock for Mac. iClock is an app first created in 1998 and recreated and rewritten many times since then. The latest version goes far beyond & replaces the old Apple Clock which only shows time/date. 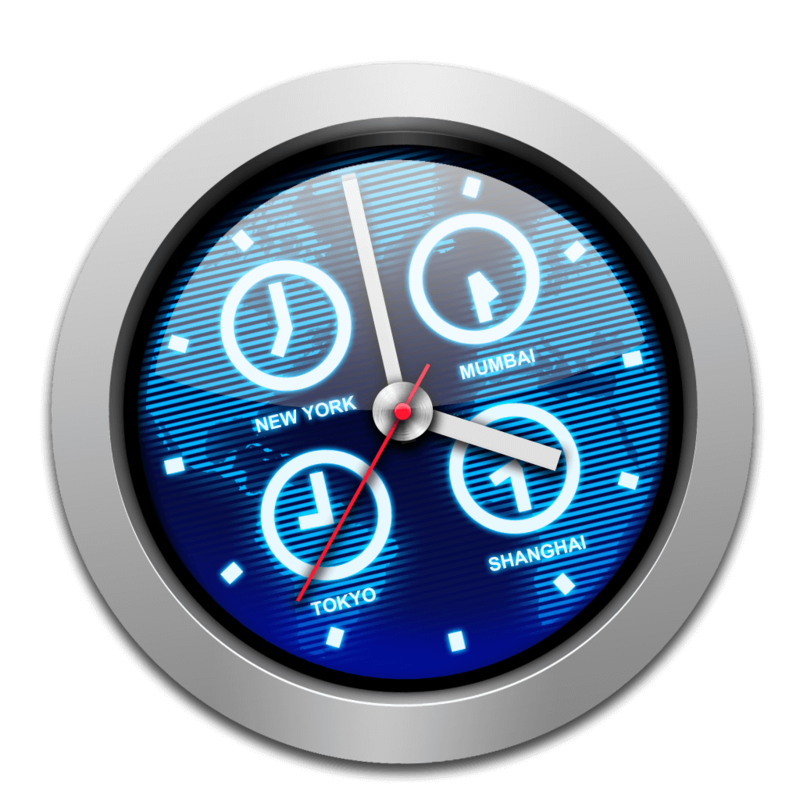 iClock enhances productivity with a slew of time related apps all found in the menubar and accessed with a tap or two. iClock provides time, date, moon phase, support for Apple and Google calendar/events, alarms, chimes with included chime sounds, global scheduling of meetings, a pomodoro timer, world clock, floating clocks, app menu, stop watch, countdown and customized printable personal calendars with photos all available with a tap on the menubar. Increase your productivity with iClock. 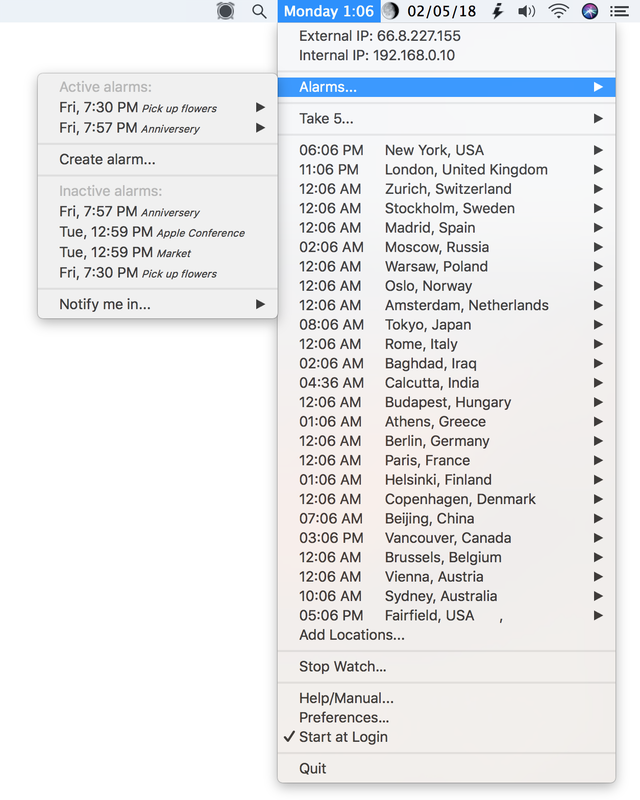 Screenshot 2 – Clicking on Time reveals this menu of cities/local time and instant ways to get various local info. 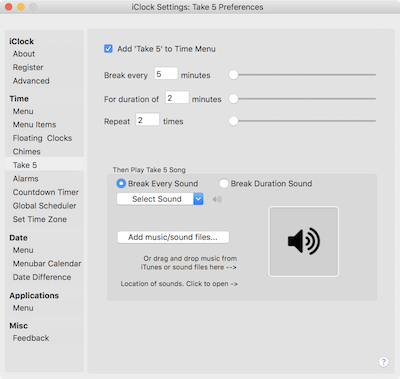 Screenshot 3 – Time Preferences. Screenshot 4 – Take5 the pomodoro timer that reminds you get a little exercise and rest your eyes each hour. 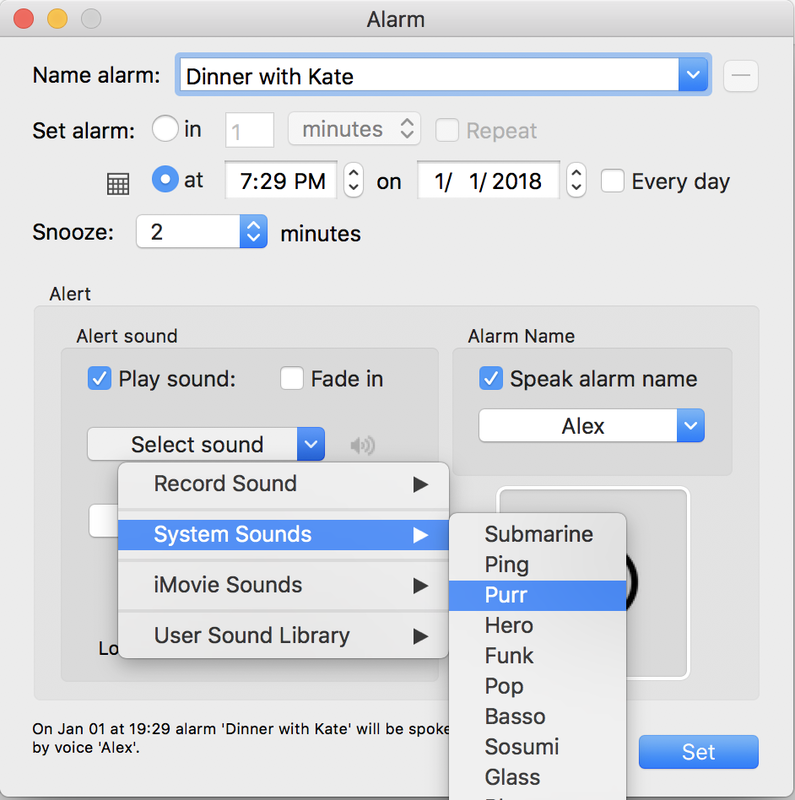 Screenshot 5 – Set alarms right from the time menu. Plum Amazing, Llc is a privately held company dedicated to creating Mac, Windows, iOS apps and of course Android. Plum Amazing is a worldwide provider of mobile and desktop applications since 1995. Plum Amazing creates and sells software via it’s own, Google and Apple’s website but also does development work (programming) for other companies and clients especially in the area of photography. We have a passion for creating great products like CopyPaste, iWatermark, yKey, iClock, TinyAlarm, TinyCal, PixelStick, SpeechMaker and others. Copyright (C) 2018 Plum Amazing. All Rights Reserved.